This can be a difficult question to answer because the circumstances are different for everyone. Some people have a lot of time to sit and clip coupons, research sales, and travel to different stores to get the best deals. Others do not have this type of time to dedicate to couponing. They instead would rather pay more at the store to have more time available for other things. The thing to remember about couponing is that it is not black and white. You do not have to be an extreme couponer to save at the grocery store. If you are one who wants to save money but cannot commit the time to couponing, there is a happy medium. The key is to start off slowly. Quickly glance through the newspaper to see if there are any coupons that you can use. Look for coupon dispensers in the store while you are shopping. Doing it this way does not take up too much time and saves you some money on a few items you would buy anyway. From here, you can then decide how much time, if any, you would like to dedicate to saving money at the store. In a nutshell, couponing can definitely be worth it as long as it fits comfortably in your lifestyle. What Are Other Ways To Save On Groceries? The good thing is that you do not necessarily need couponing in order to save money on your grocery bill. There are a few strategies you can implement today that will save you money without ever having to clip a coupon. Meal planning- One of the ways people overspend at the grocery store is through poor planning. If you find yourself in the store more than twice a week, chances are you are spending much more than necessary. It is tempting to run in and buy a lot of different things that you may or may not need. It leads to impulse shopping, and that can lead to overspending. Instead, make a meal plan for each week. Take a few minutes to jot down what your family will eat in a week’s time. Then, only buy the things you need. This will limit the extra items you would have thrown into your cart while walking around the store. Shop at discount stores- Another way to save is to change your grocery store. There are many different grocery chains that sell only their own brands. They have less overhead and pass on the savings to the customers. If you are skeptical about changing your store, just try it once. You may be surprised by the quality of the food at these stores. Only shop twice a month- You can also save if you limit the amount of time you spending in the grocery store. Consider shopping for the bulk of your groceries every two weeks. Make a list based on a meal plan and purchase enough for this amount of time. Also make sure to take a look at other items you will need, such as toiletries and cleaning products. 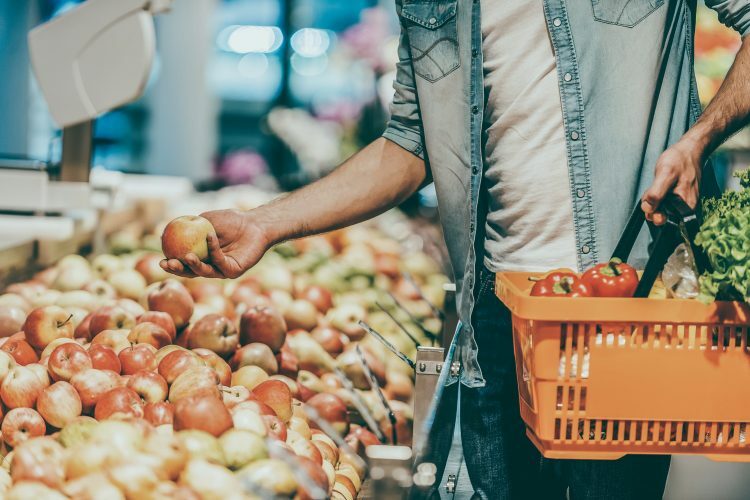 You may need to make smaller trips to the store in-between the two weeks for some fresh items like dairy and produce, but you will still see a significant savings if you start shopping this way. Saving money on your grocery shopping is one of the best ways to improve your overall budget. If you are looking for more ways to save money, check out the iRazoo blog for different tips and ideas. You can also earn points with iRazoo that will earn you great gift cards to the best retailers. You can use these cards to help offset some of your grocery expenses.